WebWatchBot's Alerting capabilities ensure that you are notified at the first sign of a problem. Use one or all of the following alerting methods. Send email alerts in rich HTML or plain text with problem explanation for immediate action. Each Watch Item can be configured for email alerts which are configured through Watch Item properties. One or more email addresses can be specified to receive the alert plus predefined reports such as the "Failure Report" which provides detail on all failures. Send a short message to your smartphone or cellphone. Short enough to not overload you with too much information, just long enough to get your attention. * SMS Gateway required. US carriers provide gateway free of charge. Check with your provider for details. Execute a command .exe or launch a new url. For example, restart IIS with iisreset.exe or launch a URL that kicks off your custom notification service. Escalation rules determine the actions to take depending on the number of consecutive failures or successes of an object being monitored. Increase or decrease the frequency of monitoring to prevent false positives or avoid flooding an overloaded server with additional requests. 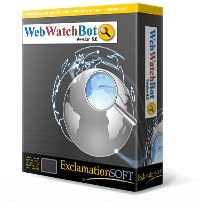 WebWatchBot allows the configuration of seperate actions when an alarm is triggered and reset.